Needless to say, I had to dig deeper to out about Ripple. 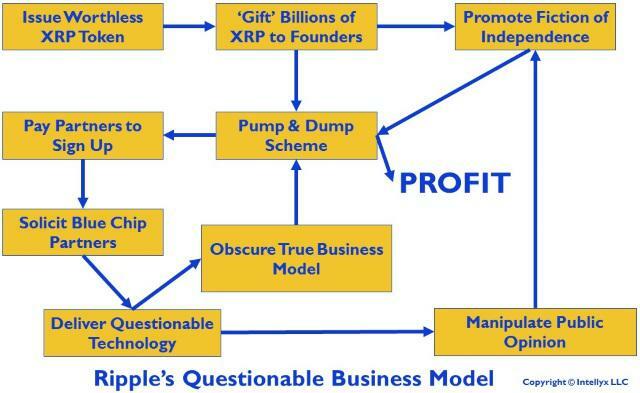 At its core, the Ripple business model is a pump and dump scheme, as it undergoes numerous activities to increase the value of the XRP cryptocurrency (crypto). Unlike most crypto pump and dumps, however, Ripple takes numerous steps to obscure this basic fact. To clarify Ripple’s business model, I put together the chart below. The starting point in the chart above is the issuance of many billions of XRP tokens – essentially printing Monopoly money out of thin air, except that you can play Monopoly with Monopoly money. However, Zagone is being disingenuous at best, as Ripple gets a say as to who can process XRP transactions, essentially making XRP a centralized, permissioned crypto. As a result, many people in the crypto community don’t even consider XRP to be a cryptocurrency at all, because it’s not decentralized. One of the strongest indicators that Ripple is a going concern is the dozens of customers it touts. Look more closely, however, and most such companies are ‘partners,’ not customers – and to make matters worse, Ripple pays companies to become partners. Where, then, does the money for these rewards come from? “The RippleNet Accelerator Program is funded by $300 million of XRP from Ripple’s XRP holdings,” the post continues. In other words, Ripple is using its share of its free XRP tokens to build the illusion it has paying customers – when in fact Ripple is paying them, not the other way around. The question of liquidity cost, in fact, is at the heart of Ripple’s international payments product strategy. For XRP to work as an intermediate currency, banks or other institutions must maintain sufficient reserves of XRP in order to respond to requests for transactions. Second, maintaining liquidity in XRP doesn’t solve the core problem with money transfers from countries with more stable currencies to those with less stable ones, as such transfers generally go only one way. For example, for a financial services firm to handle payments from the US to Guatemala, it would need to have liquidity in Guatemalan Quetzals in order to disburse payments. Liquidity in XRP would be useless. Garlinghouse, however, is confusing ‘equity’ with ‘security,’ and then obscuring his argument with the ‘Ripple doesn’t control XRP’ canard. The SEC (or other relevant national regulatory body) is the final arbiter of what constitutes a security, but the commonsense way to understand security is this: if people buy an asset with the expectation of selling it later for a profit, then it’s a security. XRP clearly qualifies by this informal definition – and in fact, Ripple’s holders of XRP are counting on this fact to pump up its value. JPMorgan’s JPM Coin, in contrast, isn’t tradable, and thus would never be classified as a security. Does Ripple’s Technology Even Work? Paying early partners to try out technology isn’t in and of itself dishonest – after all, PayPal PYPL -0.26% did something similar. However, while PayPal built a working payments infrastructure, it’s not clear that Ripple’s technology is a viable alternative to traditional payment mechanisms like Swift, or whether it can deliver on its promises at all. Some ‘partners’ like American Express AXP -1.03% ran Ripple pilots that ended up going nowhere. Others like Santander in Spain rolled out a Ripple-based product, but it didn’t deliver on the immediate funds transfer promise at the heart of Ripple’s stated differentiator. Two days, of course, is far from immediate – and may explain the poor reception to One Pay among Santander customers. Another significant Ripple ‘partner’ is Western Union WU -2.37%, who is already one of the leaders in the global funds transfer industry. Clearly, signing up Western Union to use Ripple would be a coup for the company. Given the fact that Ripple has to pay its customers to implement pilots of questionable technology, you might wonder how Ripple is still a going concern. The answer, of course, is that it really makes money only one way: by pumping up the value of XRP. Let us know your thought..